A twist on classic deviled eggs, this creamy and rich recipe includes savory bacon, cheese and onion. CUT eggs lengthwise in half. REMOVE yolks to medium bowl. RESERVE 24 white halves. Finely CHOP remaining 4 white halves. MASH yolks with fork. ADD mayonnaise, sour cream, mustard, lemon juice and pepper; mix well. ADD chopped egg whites, bacon, cheese and chives; mix well. SPOON 1 heaping Tbsp. yolk mixture into each reserved egg white half. REFRIGERATE, covered, to blend flavors. 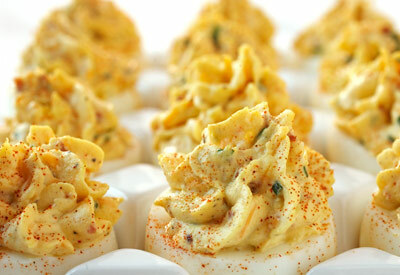 Deviled eggs can be made up to 12 hours ahead. Refrigerate, covered. Hard-boiled egg storage time: In the shell, hard-boiled eggs can be refrigerated safely up to one week. Refrigerate in their original carton to prevent odor absorption. Once peeled, eggs should be eaten that day. No-mess method: Combine filling ingredients in 1-quart plastic food-storage bag. Press out air and seal bag. Press and roll bag with hand until mixture is well blended. Push filling toward bottom corner of bag. Snip off about 1/2-inch of corner. Squeeze filling from bag into egg whites.